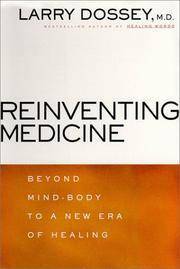 Reinventing Medicine: Beyond Mind-Body to a New Era of Healing. New York: HarperSanFrancisco, 1999. First Edition, First Printing Hard Cover Near Fine in Near Fine DJ 8vo (6-1/4 x 8-1/2), 271 pp including Notes and Index. Hardbound book is NEAR FINE -- unmarked and apparently unread (FINE except for bump on bottom of front cover) in a NEAR FINE printed DJ. 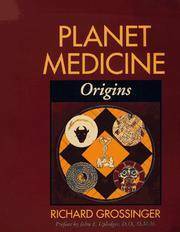 (h) People who look askance on non-traditional medicine usually change their minds when reading Dr. Dossey's work. Long considered a pioneer of the Mind-Body relationship in health, he is a serious researcher who casts a cold eye on unsupported medical claims. In this book he has -- as the subtitle indicates -- moved beyond Mind-Body, not abandoning it, but expand the context in which it works. By Grossinger, Richard; Preface by John E. Upledger. Berkeley: North Atlantic, 1995. Sixth Edition, First Printing Pictorial Wraps Very Good in VG+ Wraps Large 8vo (7-1/2 x 9-1/4), 612pp including Bibliography and Index. Trade Paper in pictorial wraps. VG+ with the exception a a very few senteces or words highlited in yellow in the first chapter. Otherwise, unmarked, tight, and clean. Cover has edge-bump bottom front, top back. Book is large and heavy, shipping may be higher than usual.